The upcoming Scottish and Welsh elections offer us the chance to look back at some great Green election successes in the past. Of course, Greens, as a fairly new electoral force have been new to the field of serious election winning. But given the scarce resources available to Greens, and the lack of a friendly press, there have been some very notable victories. We’ll be showcasing some of those over the next couple of weeks. The first we’re going to cover is the Edinburgh University Rector election of 2006, where then Lothians Green MSP Mark Ballard was able to win an historic victory. The four Scottish Universities founded before the 19th Century (St Andrews, Aberdeen, Glasgow and Edinburgh) all have an historic position of Rector. The rector is elected by either students or students and staff to a three year term. They Chair the University’s highest decision making body, the Court. Dundee University also has an elected Rector, but she or he doesn’t chair the Court. Historically these positions have been held by very famous individuals. At Edinburgh Rectors have included William Gladstone, Winston Churchill, Lord Kitchener and Tam Dalyell. Historically these figures rarely turned up to actually chair court, nor did much work to represent students. More recently working Rectors have become the norm. 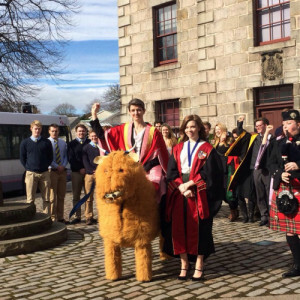 This means that, like current incumbent, Iain Macwhirter, they meet regularly with students and exercise their right to Chair the University Court. Ballard’s victory was extraordinary. For the first time a Green won a competitive election to Chair a University Court. While Ballard’s MSP colleague, Robin Harper had been rector from 2000-2003 he had been returned unopposed in a contest where candidates were had to come by. Mark was able to beat an extremely strong field including campaigning radical journalist John Pilger, former Scotsman editor and establishment favourite, Magnus Linklater and highest profile of all, Conservative MP Boris Johnson. The Johnson candidacy added an air of national significance to the election. It was one of the earliest electoral tests of the David Cameron Conservative approach. Where Conservatives would have struggled to get a hearing merely one or two years earlier, Johnson was taken seriously by students as a possible Rector. How Ballard won tells us a great deal about how Greens can win in First Past the Post and AV elections. Not content with merely trying to sneak in with 5 or 6%, Mark had to win 50% of votes once other candidates had been eliminated. For someone widely written off by a media taken with the other candidates this was far from easy. There were four key elements to the successful Ballard campaign. The first was assiduous groundwork. Mark had been working hard to get known around the University since being elected as an MSP in 2003. He’d offered to speak to student meetings, he’d met with the Principal, he’d done surgeries in student halls and Unions buildings. By meeting students where they were Mark was able to make sure that he’d be taken seriously whoever decided to contest the election. It meant that Mark’s grasp of student issues was second to none, and it also meant there were vital campaigners keen to see Mark elected. The second was a ruthless ground campaign. 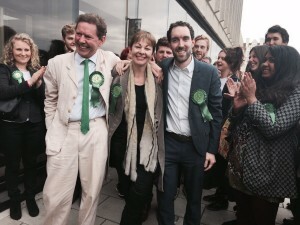 Where most Green campaigns focus on the media and on press releases or stunts, the Ballard campaign was based on a formidable door-knocking schedule, lecture announcements and street campaigning. 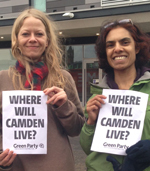 It shows that when Greens choose to take on other parties and even high profile candidates with tenacious ground campaigning, informed by a real understanding of the issues, there is no election a Green can’t compete in. The third and most important element was that while Mark was supported by environmentalists and human rights campaigners, his campaign was about student issues. By hammering the fees issue throughout the campaign Mark was able to fight the election on an issue that students really cared about. It differentiated him from the opposition, and was enough to deliver a first count lead in the election. Too many Green campaigns end up focused on what Greens want to focus on. Often these issues are peripheral to the election, or give the implicit message that it’s the planet that’s important, not the electorate. While some Greens may think that plastic bags are as important an issue as public service cuts talking about banning bags as a priority gives a very mixed message. It conveys the impression that we’re talking about public service opportunistically. The electorate will think that once elected Greens will go back to their environmentalist concerns, and disregard promises on public services. It was vital in the Ballard campaign that the core message was that Mark would be there as a voice for students. Not just a voice for the environment (though that was clearly one of his concerns), nor merely a proponent of human rights (though this was very important to him too), but as the person students could trust to stand up for them. The fourth area where the campaign was excellent was in choice of candidate. By building a strong and inclusive team, Mark was able to inspire activists to put in the extra effort needed to win the campaign. Having a strong candidate can make or break a campaign. The commitment Mark showed over a number of years to student campaigning was richly rewarded when campaigners were needed in the heat of the Rector campaign. On the night of the election the assembled media were stunned by the result. The BBC were fumbling about re-writing their prearranged “Boris Elected Rector” story. The then Head of Media for the Green MSPs described it as the most significant proactive media the MSP group had in the 2003-07 period. And the lessons for Greens everywhere are no less relevant in this years elections. By having candidates with credible profiles in their communities, by focusing on ground campaigning not the ‘air war’, and by making sure that our campaign messages are relevant to the electorate we can be competitive everywhere.